We would like to give a big Thank You to Mirtha Serret, District Supervisor of Fine & Performing Arts, for fostering a collaboration between the Union City School District and Dancing Classrooms. Thomas A. Edison School is so proud of the hard work and success of our fifth grade students who participated in the Colors of the Rainbow Team Match held at NJPAC. Dancing Classrooms has exposed our students to amazing programs such as Ballroom dancing and Hip Hop dance classes. 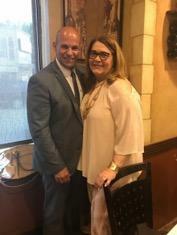 With the leadership of Mirtha Serret and Thomas A. Edison school staff, we hosted the NJ PAC Ballroom Dancing Semifinals. The amazing turnout proved that Union City is a district that promotes and values fine and performing arts with many talented performers.